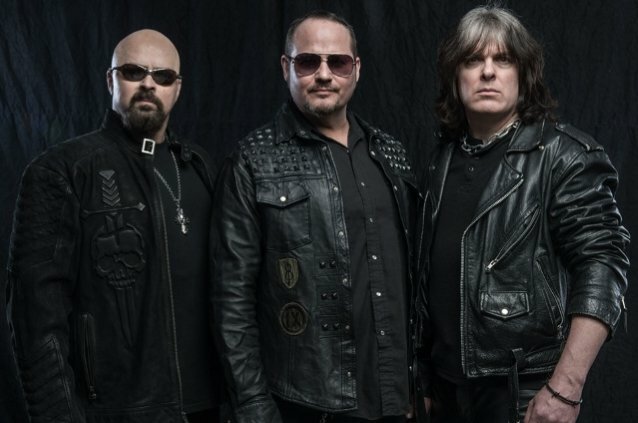 Scotty J of Rock Titan recently conducted an interview with Tim "The Ripper" Owens (JUDAS PRIEST, ICED EARTH, YNGWIE MALMSTEEN) and Sean "The Hell Destroyer" Peck (CAGE, DEATH DEALER, DENNER/SHERMANN) about their new THE THREE TREMORS project, which also features Harry "The Tyrant" Conklin (JAG PANZER). You can watch the entire chat below. A few excerpts follow (transcribed by BLABBERMOUTH.NET). Tim: "I feel great. I mean, I know Sean spent a lot of time and effort on it, and even before it came along to me to put my vocals on it. We're excited. First of all, we did a tour without the record even out yet, so that makes it even more legit and cool. But we're excited for everybody to hear this thing. 'Cause here's never really been anything like this." Sean: "My whole point was because it was the urban legend, that's the whole reason we did it — to say it was never real, it never happened and it was a great idea, [so] let's make it happen. We talked about calling it something else, but the whole point of it from the start was to be THE THREE TREMORS. Since Dickinson, Tate and Halford never did it, this is the 2018 version. It's a shame — us metal fans, it's just, like, what could have been? They would have been probably amazing, and so this is bringing that urban legend to life and making it real. Now that we've toured with it — we've played 17, 18 shows — and there's an album coming out, we have the legal rights to the name. When you Google it, we're THE THREE TREMORS now — we're the ones that actually did it. And I always say, man, if they wanna do their version of THE THREE TREMORS, that would be great for us as metal fans. We just did it 'cause the fans deserve something like this. And this is the 2018 version. When I thought about the other two guys I could get, I mean, Tim and Harry were at the top of the list. I'm just stoked they agreed to be a part of it." Tim: "Well, I think what happened was I've done several projects with different singers, but it was in South America — like, three metal singers, blah blah blah — and TRINITY with Geoff Tate [and Blaze Bayley], but it was more of a 'Let's do songs from our catalog and let's play live.' What got me when Sean mentioned it was, 'This is what we're doing. We're recording a record.' It wasn't, 'Let's go tour and play our catalog.' It was, 'Let's make a record with us singing and this is how we're gonna do it.' So I think that's what got me, because no one else has said that. And that's what makes it a unique and a better idea that nobody's done. So that's what got me, really — him saying, 'Let's make a record.'" Tim: "It came pretty easy — we just all sang the whole record. [Laughs] It makes it better that we all sang. Sean wrote the stuff and then sent it to us with the guideline vocals, and then we just sang it in voices that we thought would be right. Not the same voice — we did our own thing. And them me, I just went in and attacked the whole record. So that's what made it even more difficult when we went to tour. Sean and David [Garcia, guitar] made the record and picked out how to do it and spent a lot of time trying to figure out who was going to sing what. So we didn't have a specific thing to sing. And it makes it even better, because we just attacked the whole record. So it's kind of cool to do it that way as well." Sean: "It was a blast, man. It was, I think, 17 shows in 19 days, so it was fast and furious, and before you knew it, it was over. But Cyprus, Israel, Greece, Bulgaria, up into Switzerland, Austria, Germany, Holland, Belgium, Sweden and then ended with a really cool show in Copenhagen, Denmark where we played a couple of songs with Michael Denner from MERCYFUL FATE. So it was great, man. We had to figure out who was gonna sing what on the fly and sometimes we did it a little different every night. But we played the entire album — all 12 songs — every night and the crowd really responded great to 'em, never hearing 'em before. We didn't really plan it to go that way, just because the distributor made us push the release out to January. But after being home, it's kind of cool that we went out and did a whole tour before the album's out, before it's even available. It's something that is a big way to advertise it. And I think it's gonna work to our benefit." Tim: "It was great. We had a blast. The band is so good — the CAGE guys — and I think it makes it that much more enjoyable when you've got a good band and everybody gets along. We had a lot of fun. We laugh at Harry a lot. We all tell jokes. It was fun to do it. And I think what was, again, cool was that nobody knew the songs. We played a couple from our history, but really, just a few of 'em — a couple of PRIEST classics we threw in just to have fun at the end. But I think it was really special because no one has even heard it yet. So we're trying out these songs [in front of an audience] — the whole record — where nobody knew one song. They had a few teasers on the Internet, so they knew one or two [songs] from video things and teasers, but that's about it." Sean: "It's looking like we're going to do the West Coast, probably Texas, the Midwest and the East Coast in between mid-February and mid-March. The reaction has been really good from the promoters, even though, again, the album's not even out; we haven't even released our big, mega, crazy music video yet; and the press is just starting to hit. So it's cool that we've had a trickle-down effect of these U.S. promoters, 'cause they're really embracing it and jumping on it. So there's gotta be some kind of buzz so far. But, like Tim said, there's nothing like this. When you see us three onstage and the original music, it's a unique thing and it's super-powerful. It's killer." THE THREE TREMORS' self-titled debut LP is due on January 18, 2019 via Steel Cartel. 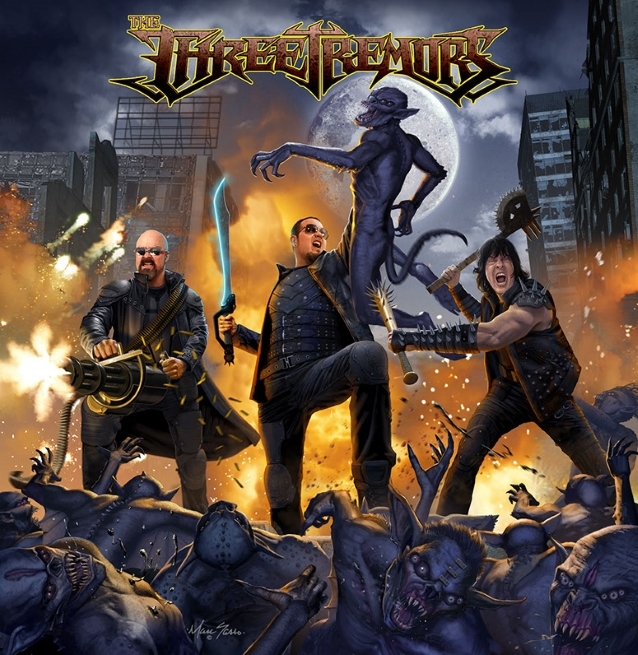 The disc highlights artwork ingeniously created by renowned artist Marc Sasso (DIO, HALFORD, ADRENALINE MOB, DEATH DEALER), to showcase an apocalyptic battle between demonic hyper-wolves and the Three Tremors, who marched into an underworld overshadowed by evil forces only armed with bullets powered by heavy metal sorcery to reclaim the dystopian lands.